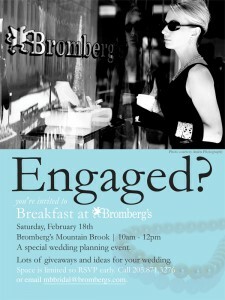 We are so excited to be participating in The Breakfast at Brombergs Event on February 18th. We will be there with a few of our wedding industry friends meeting and greeting with brides. If you or any of your engaged , soon to be engaged or may never be engaged friends are looking for a fun thing to do, dress on your Audrey Hepburn best and head over to Brombergs! This event is so much fun! I can't wait to see you there!